Born in Quebec City on November 30, 1939, Louis LeBel is the son of Paul LeBel, Q.C., and Marguerite Sasseville. On August 28, 1965, he married Louise Poudrier, a daughter of Louis-Philippe Poudrier and Dorothée Labrie, in Quebec City. His wife, who is a lawyer and has an LL.D., was a full professor in the law faculty of Laval University until 2000. The couple have three children, Paul, Catherine and François, and several grandchildren. Louis LeBel received a B.A. from the Collège des Jésuites in Quebec City in 1958 and an LL.L. from Laval University in 1961. He was awarded the Governor General's medal, the Lieutenant General's medal and the Tessier silver medal. He was called to the Bar in 1962. He received a graduate degree (DES) in private law from Laval University in 1965 and an LL.M. from the University of Toronto in 1966. He practised law in Quebec City, first with LeBel, Letarte, Bilodeau, Boily from 1963 to 1964 and then with Désilets, Grondin, LeBel & Associés from 1964 to 1971, before becoming a partner at Grondin, LeBel, Poudrier, Isabel, Morin & Gagnon, where he practised from 1971 to 1984. Louis LeBel has written various legal articles and studies, and he co-authored, with Robert-P. Gagnon and Professor Pierre Verge, Le droit du travail en vigueur au Québec, published by Les Presses de l'Université Laval. He has also been a member of various committees of the Barreau de Québec (Quebec City Bar) and the Barreau du Québec (provincial Bar association), including the editorial board of the Revue du Barreau, which he sat on from 1976 to 1982 and chaired from 1979 to 1982. 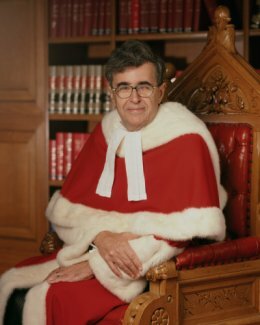 He was a member of the board of directors of the Corporation du Centre communautaire juridique de Québec from 1973 to 1975, and sat before that on the legal aid committee of the Barreau de Québec. He also served as Vice-president of the Barreau du Québec from 1982 to 1983 and as Bâtonnier of Quebec from 1983 to 1984. He taught as a visiting professor at the University of Ottawa and Laval University.